John Cook (PhD MSc BSc CEng MBCS CITP FHEA) is Professor of Technology Enhanced Learning (TEL) at the Learning Technology Research Institute, London Metropolitan University. The nature of learning is being augmented by new digital tools, particularly by mobile devices and the networks and structures to which they connect people. In this paper I examine some longitudinal research 'threads' that have pervaded my work over the last two decades: (i) the powerful perspectives on learning and development put forward by Vygotsky, (ii) an evolutionary educational design research approach, and (iii) notions surrounding the temporal nature of learning. Specifically, this paper explores these threads through narrative 'snap shots' of my research, from the past and present, in order to propose some preliminary thoughts on the nature of what I am calling Augmented Contexts for Development; an extension of Vygotsky's Zone of Proximal Development that takes into account the characteristics of 21st Century mass media structures, agency and practices. There appears to be a generality uncovered by my proposed visualisation/augmentation oriented approach; learners are supported as they co-create temporal contexts where the time field of attention becomes detached from the perceptual field and unfolds itself in time, thus augmenting development and learning. Future work into Augmented Contexts for Development will have as a goal the desire to investigate the means by which digital technology and media can be used to mediate formal and informal learners meaning making as they independently navigate or unfold their attention in relation to temporal dimensions. Keywords: Educational design research , digital technology mediated learning , Zone of Proximal Development , mobile learning , Augmented Contexts for Development , temporal nature of learning , attention and perception in learning. Keywords: Educational design research, digital technology mediated learning, Zone of Proximal Development, mobile learning, Augmented Contexts for Development, temporal nature of learning, attention and perception in learning. In this paper I examine three longitudinal research 'threads' that have pervaded my work over the last two decades. These threads surfaced when I was invited to reflect on my past and present work for a talk (Cook, 2009a) at the Computers and Learning Research Group's 30th Anniversary event, held at the UK's Open University, in May 2009. My past work revolved around the design of computer-based learning support for 'mentoring, metacognition and music'; I was already researching in this area when I joined the Computers and Learning Research Group in 1992 as a part-time PhD student (for example outputs see Cook, 1993; Cook, 1994; Cook, 1998a; Cook, 1998b; Cook, 2001). Fast forward to the present day; I am now researching the social, cultural and personal issues surrounding mobile learning (for example see Cook, Pachler and Bradley, 2008; Cook, 2009a; 2009b; 2009c; Cook, 2009d; Cook and Adami, 2009; Cook and Pachler, 2009; Pachler, Cook, and Bachmair, 2010; Pachler, Bachmair and Cook, 2009). My three longitudinal research 'threads' are as follows: (i) the powerful perspectives on learning and development put forward by Vygotsky, (ii) an evolutionary educational design research approach, and (iii) notions surrounding the temporal nature of learning. The first research thread revolves around an exploration of how the powerful perspectives on learning and development presented by Vygotsky (1978/1930) can be used and extended to the design of digital tools that scaffold and/or augment interactions between collaborating learners. A second research thread draws on a educational design research approach to investigating the role that digital tools play in mediating learning. I have taken an evolutionary approach to educational design research (Cook, 2002) that makes links between theory, empirical work and digital-tool/artefact implementations that intend to mediate learning. An important conclusion from my reflections on the above 'past and present' research is that there is an underlying 'temporal' thread to the learning and development work that I have investigated, i.e. there is a third, non-obvious thread to my work. Furthermore, later in this paper I will contextualise these three research 'threads' by arguing that the context for learning in the 21st Century has brought about the need to re-conceptualize or extend theories from the past. The nature of learning is being augmented by new digital tools, particularly by mobile devices and the networks and structures to which they connect people. This has led me to conclude that Vygotsky's notion of a Zone of Proximal Development, which was developed in the context of 20th Century Industrial Revolution, needs to be extended to what I am calling Augmented Context for Development (see also Cook , 2010). This paper explores narrative-style 'snap shots' of my research from the past and present in order to present some ideas for the future: i.e. my preliminary thoughts on the nature of Augmented Contexts for Development research. The remainder of this paper is structured as follows. First an overview is provided of what are, for me at least, the key concepts put forward by Vygotsky and how they were used in my PhD thesis (Cook, 1998a). A presentation then follows of the evolutionary approach to educational design research; this uses my thesis work on a mentoring-style, computer-based agent called MetaMuse to illustrate this methodological perspective. I then briefly go on to present some of my post-doc work on MetaMuse, which examined how to actively structure cooperative problem-seeking dialogues in learning. In particular, in this work I examined the notion of looking forward to predict how a creative, musical idea will sound when performed and then structured interactions to foster the looking back on how the performance actually sounded. Importantly, this study proved a key moment in my research; it put me at the crossroads as it were. Subsequent work started to move down a new direction in order to support learning, specifically providing rich visualisations and an examination of informal and mobile learning (e.g. see Cook, Pachler and Bradley, 2008; Cook, 2009d). An examination is then provided of some characteristics of the 21st Century that impact on learning; I will argue that this new social and cultural context has been brought about by changes in mass communication. Consequently, I propose an extension of the Zone of Proximal Development into Augmented Contexts for Development (see also Cook, 2010). Finally, I will conclude the paper by using a case study of recent work at LTRI (http://www.londonmet.ac.uk/ltri/) on location-based, mobile learning at a heritage site in the UK to explore what the Augmented Contexts for Development may look like, particularly from a conceptual perspective. I conclude with several possible future research directions. My vision is that when fully realised, the concept of Augmented Contexts for Development will enable learners to independently and collaboratively unfold their attention in time, thus enabling them to travel a temporally dynamic developmental learning journey without necessarily moving to a formal place of learning. Society experienced technologically and socially driven transformations during the industrialisation of the first third of the 20th century; it was against this background that Lev Vygotsky defined the characteristics of human development as a development which is based on the instrumental conditioning of reflexes or as the extension of the body by tools for mastering nature (Vygotsky 1978/1930, p. 19 ff.). The "higher psychological processes", as Vygotsky termed them, result from a relation "between human beings and their environment, both physical and social" (p. 19). Vygotsky considered "social interactions" to be those like 'to speak' as the transformation of practical activities such as 'to use a tool'. The leading processes are that of internalization and that of the instrumental use of a tool; this happens where "An operation that initially represents an external activity is reconstructed and begins to occur internally" (Vygotsky 1978/1930, p 56-57). Further, the social situation of the external activity, like the conditions for the use of tools, is internalized: "An interpersonal process is transformed into an intrapersonal one" (Vygotsky 1978/1930, p 57). These processes of internalization depend on the children's development (Vygotsky was concerned primarily with child development): "The transformation of an interpersonal process into an intrapersonal one is the result of a long series of developmental events" (Vygotsky 1978/1930, p 57). "It is the distance between the actual developmental level as determined by independent problem solving and the level of potential problem solving as determined through problem solving under adult guidance or in collaboration with more capable peers … The zone of proximal development defines the functions that have not yet matured but are in the process of maturation, functions that will mature tomorrow but are currently in embryonic state. These functions could be termed the "buds" or "flowers" of development rather than the "fruits" of development. The actual development level characterizes mental development retrospectively, while the zone of proximal development characterizes mental development prospectively." This was a significant paradigm shift, because up until that point a child's mental development had been assumed to be indicated only by those things that children could achieve on their own, whereas Vygotsky took the view that "what children can do with the assistance of others might be in some sense even more indicative of their mental development than what they can do alone" (Vygotsky, 1978/1930, p. 85). Furthermore, as can be seen by the words I have highlighted in bold in the above quote, development in a zone of proximal development has a forward looking, temporal and prospective dimension. In summary, Vygotsky (1978/1930, p. 90) proposed "that an essential feature of learning is that it creates the zone of proximal development; that is, learning awakens a variety of internal developmental processes that are able to operate only when the child is interacting with people in his environment and in cooperation with his peers. Once these processes are internalized, they become part of the child's independent developmental achievement." The implication of Vygotsky's line of argument on internalization and child development was, and continues to be, important in terms of learning from childhood onwards: it is not the learning object that is ruling the learning, but the student's development, i.e. the phases within a student's development, the so-called "zones of proximal development", in which the student is susceptible to internalizing learning objects. As can be seen from the above quote, this process relies on interaction with people. Thus the term "Zone" can be seen in the traditional category of child development, or as a developmental phase or in a situational category within a specific context. This conceptual approach brings together child development and curricular learning by a context, i.e. the zone of proximal development, and offers scope for the theoretical integration of teaching, learning, and development with the culturally new user/learner generated and mediated contexts. Vygotsky made a clear distinction between learning and development: "the most essential features of our hypothesis is the notion that developmental processes do not coincide with learning processes. Rather the developmental processes lag behind the learning processes; this sequence then results in zones of proximal development." (Vygotsky 1978/1930, p 90). I am interpreting this to mean that learning awakens, and can set in motion, a variety of internal developmental processes (culturally organized psychological functions) that would be impossible without learning. Thus, there is a temporal role for learning as a hook that pulls developmental processes into the future of what is possible. "The KMf thus has a Vygotskyian ([1930/]1978) conception of learning, where the teacher mediates knowledge about the society and culture so that it can be internalised by the learner. This is similar to what Lipman (1991) calls 'thinking that is self-correcting', i.e. where a participant in a "community of inquiry" is able to internalise the methodology of the community (where members begin looking for and correcting each other's methods and procedures) as a whole, each is able to become self-correcting in his or her own thinking." As can be seen from the above, I took a very teacher-centric view of learning. However, Lipman's (1991) elaboration of Vygotsky was helpful as he had applied it to the use of poetry as a means to create a community of inquiry, a I will return to the conceptual perspectives of my Vygotskian research thread later in this paper. Next, I examine my second research thread in more detail, one that is based in the educational design research approach. "The challenge of design-based research is in flexibly developing research trajectories that meet our dual goals of refining locally valuable innovations and developing more globally usable knowledge for the field." Along similar lines, Plomp (2009) has recently summarized design-based research, which is also referred to as 'educational design research' (a term used henceforth) as addressing complex problems in educational practice. Educational design research tends to have interventionist characteristics, is process oriented and contributes to theory building (Plomp, 2009, p. 17). Indeed, educational design research is context bound in nature, which means generalizations from this type of work tend not to be context-free. However, Design Researchers do strive for generalisable design principles whilst generalising to a broader theory (Plomp, 2009, p. 33). Consequently, we can conclude that the emerging educational design research approach provides a frame or lens through which we can examine the unique affordances of mobile learning. What educational design research means in simple terms is that we need to consider repeated cycles of: empirical work, theory/model development and tool development. These particular aspects are typically conceived as overlapping activities and phases (rather than as sequenced 'steps'); this is illustrated in Figure 1 for the KMf described above. 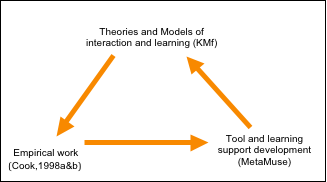 Figure 1 is thus an evolutionary educational design research approach to analysing the role of theory/models, empirical work and technology in learning (see Cook, 2002 for detail). As well as being used to guide my own work and the work of PhD students at LTRI, this approach has also been used to underpin the development of Design Studies and Demonstrators in the European Commission funded projects MATURE (Deliverable 6.1, http://mature-ip.eu/overview); see also Ravenscroft, Schmidt and Cook (2010). Specifically, the purpose of this evolutionary approach is the mapping out of not a specific theory, but a mapping out of how different researchers are working towards the creation of theories. The point being that in the evolutionary approach there is a requirement to be transparent about the theory and models in use. This requirement, in itself, may not communicate well from one discipline to another, as words have different meanings in different disciplines; indeed, words have different meanings within a discipline. The only solution to this problem is, in my view, careful and continuing dialogue between all stakeholders. In my earlier work (Cook, 1998a; Cook, 1998b) which is summarised in Figure 1, I explored the systematic relationships involved when moving from theory, i.e. the KMf at the top of Figure 1, to an analysis of corpus data (Cook, 1998a&b) of several sessions of a teacher and a learner interacting to solve a musical problem (so moving anti-clockwise around the triangle in Figure 1). An analysis of corpus data (Cook, 1998a&b) of human teacher-learner interactions revealed the most frequently used teaching interventions in the domain of musical composition and creative problem-solving interactions (I will summarise these below), and also revealed typical student responses. These empirical findings were used to inform the design of MetaMuse, which used a set of empirically derived interaction patterns to 'scaffold' (Wood, Bruner and Ross, 1976) the creative problem solving of an individual learner interacting with the system, thus moving them along a zone of proximal development. See Cook (2010) for a more comprehensive review of educational design research (my second research thread). In the next section, I briefly present some of my post-doc work on MetaMuse, which examined how to actively structure cooperative problem-seeking dialogues in learning. In particular, in this work I examined the third thread of my research, i.e. temporality in learning, in that I went on to investigate the notion of looking forward to predict how a creative, musical idea will sound when performed and then examined the structured interactions that ensued to foster the looking back on how the performance actually sounded. 4 A Case Study of Cooperative problem-seeking dialogues in learning. The results of the above educational design research intervention (Cook, 1998a&b), i.e. my second research thread, indicated that the most frequently used teaching interventions related to problem-seeking were 'critical probing' (focused questions were used by a teacher which were based on observations of a student's musical phrase; these questions had the goal of helping the learner 'find' a problem specification) and 'target monitoring or reflection level' (open-ended questioning that involved the teacher's attempts to elicit verbal self-explanations from the learner about their own attempts at specifying a problem). Learner problem-seeking involved 'critical clarification' (elaboration and refinement of some point may be requested or given because (i) a previous attempt was unclear or (ii) a response was required) and 'critical give reasons' (any interaction that involves the giving of criteria as a reason). Interaction relating to problem-seeking, therefore, was seen to revolve around a process of find-predict-explain-refine; this process was achieved (by the interacting student and tutor) primarily through the adoption of the goals 'probing, target, clarify and give reasons'. These empirical findings were used to design MetaMuse. The MetaMuse interface structured the interactions between the MetaMuse agent routines and the learner(s) by providing a series of menu options and buttons which were intended to support collaborative problem-seeking dialogue. In this sense, the interactions were being 'augmented' by the structuring approach provided by MetaMuse. For example, at an appropriate point MetaMuse would put up a message encouraging pairs of learners to predict to each other how a new musical phrase would sound when it was eventually played back by MetaMuse. In post doc work (see Cook, 2000) I ran another educational design research study with MetaMuse (so going from the bottom right of Figure 1 anti-clockwise). Six sessions were conducted that involved pairs of cooperating learners interacting with each other and MetaMuse (see Figure 2). "Future work will focus on using our model … to generate STNs [State Transition Networks] that model how pairs of cooperating learners interacted successfully. These prescriptive models of cooperation will be used as the basis for tutoring tactics when MetaMuse is pursuing a goal. For example, the goal 'probing and target' (described above) has one implicit intention of getting the learners to explain if a musical outcome matches their prediction." In particular in this post doc work I elaborated on the notion of looking forward to predict how a creative, musical idea will sound when performed and then looking back on how the performance actually sounded (as indicated in bold in the above quote). This is a first hint relating to the temporal nature of learning, a thread of my work that resurfaces below. Another key notion was the idea that MetaMuse should 'scaffold' (Wood, Bruner and Ross, 1976) the learners' interactions in the zone of proximal development. This intention meant that it seemed possible to embody in the code of the MetaMuse agent the ability of what Vygotsky (1978/1930, p. 86) called a "more capable peer" so that the agent could scaffold learning. However, I never pursued this line of work; it seemed to me at that point in time (2000 to 2002) that 'engineering' the extensive interactions that the agent would need to possess - in order to be able to deal with all the eventualities that could arise in problem-seeking dialogues - was simply not possible. Indeed, this is a problem that much 'Intelligent Tutoring Systems' research has also encountered; although this field has found some ingenious 'work arounds' to this problem. Consequently, this study proved a key moment in my research story which, as we will see below, started to move in the direction of supporting learning by providing rich visualisation and informal learning opportunities within an augmented, mobile learning environment. However, as we will also see below, my three research threads - i.e. a Vygotskian oriented, educational design research investigation of the temporal nature of learning - remains intact. Fast forward in my narrative-style 'snap shots' of my research to the present day; I am now researching the social, cultural and personal issues surrounding mobile learning. Specifically, I argue that the context for learning in the 21st Century has brought about the need to re-conceptualize or extend theories from the past. The nature of learning is being augmented by new digital tools, particularly by mobile devices and the networks and structures to which they connect people. This has led me to conclude that Vygotsky's notion of a Zone of Proximal Development needs to be extended to an Augmented Context for Development (see also Cook, 2010). In order to expand on this argument, below I consider this changing context for learning. First however, I summarise my personal understanding of Vygotsky's work up to up about 2007-8 (reviewed above). The implication of Vygotsky's line of argument is that the phases within a student's development are key, i.e. the so-called 'zones of proximal development', in which the student is susceptible to internalizing learning objects. This process relies on interaction with people. Developmental processes do not coincide with learning processes. Learning awakens, and can set in motion, a variety of internal developmental processes (culturally organized psychological functions) that would be impossible without learning. Thus, there is a temporal role for learning as a hook that pulls developmental processes into the future of what is possible. Further, this conceptual approach brings together child/adult development and curricular learning by a context, i.e. the zone of proximal development, and offers scope for the theoretical integration of teaching, learning, and development with the culturally new user/learner generated and mediated contexts. Finally, my post-doc work surfaced the idea that it seemed possible to find a non-human substitute for what Vygotsky (1978/1930, p. 86) called a "more capable peer", where digital technology could scaffold learning. A move away from a traditional editorial system towards archives such as media platforms. A move away from a push to a pull system of media distribution. The use of the mobile phone with a variety of applications as ubiquitous personal media tool. Convergence of the above with Web 2.0 tools for the Internet. New structures being developed for the Internet, i.e. media platforms like YouTube, Flickr and MySpace (these new media platforms are also new forms of archives). These structural changes to mass communication also affect the agency of the user and their relationship with traditional and new media. For example, the BBC has traditionally acted as being 'in editorial control': commissioning programmes and broadcasting them through a predefined schedule that is transmitted on television. Now mass media is witnessing a trend where the 'user' can generate their own content with a mobile phone or other digital device in the form of pictures or video clips; they can then go on to publish them almost immediately on the Internet via media platforms like Flickr (for annotated photographs), Twitter (for micro blogs or 'diary like' social messages that are no longer than 140 characters), FaceBook (a social networking site) or YouTube (for video clips and commenting). For example, YouTube is not a traditional form of mass communication; it is essentially a lot of individuals publishing user generated content (in the form of videos that a user has produced themselves or as digital media that has been copied from some other source, the latter may be subject to copyright restrictions). Consequently, I am suggesting that what society is seeing now is an 'augmented communication context'. Not only do the 21st Century structures of mass communication provide a wide range of augmentations to communication, but in addition through the agency of users, the context within which communications take place are augmented by the users to suit the needs of the individual and/or the community. Consider Twitter as another example. By carefully selecting who you follow on Twitter, and by judiciously responding to requests and by commenting, and by feeding in tweets that are germane, it is possible to build a powerful community for professional practice (and of course build a network for socialisation). Indeed, these Twitter communities, like my own (see http://twitter.com/johnnigelcook) can start to resemble a community of inquiry (Lipman, 1991), which I described in section 2, where a participant internalises the methodology of the community, where members begin looking for and correcting each other's methods and procedures, and where each member is able to become self-correcting in his or her own thinking. In this example, Twitter provides a structure that augments mass communication, but it is the way in which individuals augment the context to suit their own needs that enables the opportunity for development and learning. Whilst acknowledging that learners are increasingly using digital interactions as a key part of their social networking, I suggest that not enough is known about how to effectively design learning activities that are pedagogically effective at embedding digital technologies and augmented communication contexts. Specifically, I suggest that there is a need for answers to this question in a diverse set of perspectives: how do educators balance digital interactions like those used in social networking with authentic learning tasks? Digital interactions means mobile device use, MSN, email, chat rooms, online SIGs, Twitter, FaceBook, YouTube, etc. Consequently, below I have attempted to extend Vygotsky's theoretical argument around the 'Zone of Proximal Development', which was developed against the background of the 20th Century Industrial Revolution, in order to accommodate the 21st Century trend to augmented mass communication that is personally relevant to and within contexts and communities. An important conclusion from my reflections on the above work is that there is an underlying 'temporal' thread to the learning and development that I have investigated (a third research thread). Below I provide a brief report of the implementation, and an analysis, of a mobile phone based design that intended to foster an Augmented Context for Development (see also Cook, 2010). This work was conducted as part of the EC CONTSENS project (http://tiny.cc/5wdUr). The aims of the work-package presented here was to (i) support archaeology students as they engage with a contextualised, historical account of the units that contribute to the construction of a Cistercian Abbey in Yorkshire, UK, and (ii) provide rich mobile-phone based visualisations and video blogs to augment archaeology students' learning whilst on a field trip. What makes the approach described here of interest is the notion that I am attempting to extend the Zone of Proximal Development into an Augmented Context for Development. The case study is used below to examine, from a process and explanatory perspective, the inner features of the situation. Note that the mobile phone based learning support did not attempt to structure the interactions, as was the case with MetaMuse described above. Instead, the project team had specifically set out to design a mobile Augmented Context for Development that is able to respond supportively to, and that acts as a challenge for, collaborating learners in situ (i.e. scaffold the learning). The multimedia designer for the project, also my research student, made use of rich 3D visualizations and multimedia to augment the context in such a way that would, we predicted, allow collaborating learners to interact: with each other, with the mobile phones and with the physical environment in order to generate their own context for development (thus we started from the top of the triangle in Figure 1 with theory, we moved clockwise in the evolutionary educational design research to develop an mobile tool, and we then continue on to the bottom-left to run empirical work). Tasks were devised with an archaeology tutor from Sheffield University that gave students a framework within which to operate. One task stated: "Look at a movie [see Figure 3] of the reconstruction of the interior of the church including the Nine Altars. Discuss the evolution of the structure of the abbey. Make a video blog of your discussion using the Nokia phone." In terms of tools (the bottom right of Figure 1) the project made use of HTC smart phones, running the Mediascape authoring environment ( http://www.mscapers.com/). Nokia N95s allowed students to produce video podcasts/blogs of themselves and take photos (user generated content). The 'Mscape' player on the HTCs was designed to allow learners (Figure 4) to move through the physical world and trigger digital media (which was stored on the phone); this was achieved via GPS and an invisible interactive map. Mediascape is freely available, open source software that is easy to set up; this is seen as an advantage in that it is part of a mediating infrastructure that will enable Augmented Contexts for Development to become more pervasive. The empirical results (we are at the bottom left of Figure 1) that I wish to discuss here revolve around my qualitative analysis of video data  of students interacting with the mobile phone-based tool (Table 1). The analysis appears to illustrate that the 'co-constructed area' linking the physical world (i.e. what is left of the Cistercian Chapels), and the virtual world that is visualised in 3D on the mobile devices (Figure 3) is inhabited by a shared representations or 'time field' - I will explain the latter below - that is jointly owned by the students, and that this appears to indicate development and learning. This qualitative analysis is followed by a re-examination of Vygotsky's notions on perception and attention in an attempt to conceptualise what it is we are observing in this sample interaction. Student 1: So those windows, up there isn't it, still? Is that right? So those have all changed since then. Student 2: Yeah there was like another stage between this one and this one. Student 2: With three vaults. Student 1: There's three on that side at the moment and three on that side. Student 1: So three have come down haven't they, along with the window. Student 1: Do mean with the pillar? Student 2: Yeah, you can see it's this way (?) but it's stopped there. Student 1: That's right (makes gestures for a pillar and they both stare into the space where the missing pillar should be). (student 1 is female, student 2 is male). There is a real sense in the above transcript of the pair collaborating to solve the problem of what happened to the Abbey across time. Student 2 frequently uses the word 'see', indicating that the physical and digital representations interact and inform one another in real time. I suggest that the use of the word 'see' and the gestures in the transcript indicate that the students are arriving at a joint or shared cognitive visualization/representation and explanation that solves the problem of what changes have occurred to the Abbey over time. There are clearly some transformational processes at play here, with a rapid interplay between external, tool-based and internal representations. Furthermore, it is noteworthy that the Augmented Context for Development that we have created appears to act as a substitute for the 'more capable peer'. Also, within our design the learners' embed their own Augmented Contexts for Development, as they evolve their understanding of the architectural form under investigation. The photograph in the Figure 4 (and the QuickTime movie, see footnote 2) add an additional layer of context to the above interaction; this revolves around gender, partnership and dominance. Both students are already what we might call 'elite', they have reached university, we can assume that they are good at problem-solving and want to do well, get a job, etc. The male student on the left is Spanish and 'holds on to' the mobile phone for the observed segment, thus reinforcing the gender stereotype whereby males 'hog' the technology. However, the female student (English) is very active in the interactions and appears to be learning a lot from the context, thus raising the suspicion in my mind that she will perform very well in her university studies and continue the trend where females outperform males at UK universities. Two key questions that arise from the above qualitative analysis are as follows. What are the transformational and temporal processes at play in the Cistercian Chapels transcript? Were we really seeing a rapid interplay between external, tool-based and internal representations? In order to consider these questions, below I revisit some of Vygotsky's (1978/1930) notions of the development of perception and attention (we have moved back to theories and models at the top of the educational design research triangle in Figure 1). The focus is, as stated above, on the process and explanatory perspective, the inner features of the situation.
" The system of signs restructures the whole psychological process and enables the child to master her movement. It reconstructs the choice process on a totally new basis … Attention should be given first place among the major functions in the psychological structure underlying the use of tools … the child is able to determine for herself the "centre of gravity" of her perceptual field; her behaviour is not regulated solely by the salience of individual elements with it … In addition to reorganizing the visual-spatial field, the child, with the help of speech, creates a time field that is just as perceptible and real to him as the visual one. The speaking child has the ability to direct his attention in a dynamic way. He can view changes in his immediate situation from the point of view of activities, and he can act in the present from the viewpoint of the future." "Thus, the child's field of attention embraces not one but a whole series of potential perceptual fields that form successive, dynamic structures over time. The transition from the simultaneous structure of the visual field to the successive structure of the dynamic field of attention is achieved through the reconstruction of the separate activities that are a part of the required operation. When this occurs, we can say that the field of attention has detached itself from the perceptual field and unfolded itself in time, as one component of a dynamic series of psychological activities … The possibility of combining elements of the past and the present visual fields (for instance, tools and goals) in one field of attention leads in turn to a basic reconstruction of another vital function of memory … Through verbal formulations of past situations and activities, the child frees himself from the limitations of direct recall; he succeeds in synthesizing the past and the present to suit his purposes. The changes that occur in memory are similar to those that occur in the child's perceptual field where centres of gravity are shifted … The child's memory not only makes fragments of the past more available, but also results in a new method of uniting the elements of past experience with the present." "Created with the help of speech, the time field for action extends both forwards and backwards. Future activity that can be included in an ongoing activity is represented by signs. As in the case of memory and attention, the inclusion of signs in temporal perception does not lead to a simple lengthening of the operation in time; rather, it creates the conditions for the development of a single system that includes effective elements of the past, present, and future. The emerging psychological system in the child now encompasses two new functions: intention and symbolic representations of purposeful action." The temporal nature of learning is well articulated in the above quote, and I have discussed this from a conceptual level above. However, what remains unclear to me at this moment in time is how my work relates to the notion, mentioned above, of the functions of intention and symbolic representations of purposeful action. Above, I suggested that the mobile visualisations act as a tool but also as sign denoting a future 'time field' that the students can form the intention to develop towards. Consequently, this challenge of intention and symbolic representations will form the focus of future work, which I will touch on briefly below. Indeed, the above analysis has the limitation of being a 'snap shot', a more comprehensive developmental analysis would need to return to the source and reconstruct all the points of development within the structure of the Augmented Contexts for Development. That said, I claim that this section has gone some way to laying the conceptual foundations for the notion of Augmented Contexts for Development. The nature of learning is being augmented by new digital tools, particularly by mobile devices and the networks and structures to which they connect people. In this paper I have argued for the notion of Augmented Contexts for Development as an extension of the Zone of Proximal Development. There appears to be a generality to the visualisation/augmentation oriented approach in terms of both supporting learners as they co-create temporal contexts, where the time field of attention becomes detached from the perceptual field and unfolds itself in time as collaborating learners move forward. However, it should be noted that ethical issues surrounding tracking location and activity via mobile devices and need constant attention. Future work into Augmented Contexts for Development will have as a goal the desire to investigate the means by which digital technology and media can be used to mediate formal and informal learners meaning making as they independently navigate or unfold their attention in relation to temporal dimensions. Specifically, future research will revolve around the following issues and questions. During their activity, what will the learning trail left behind by learners tell us as they move from one learning context to the next? How does this relate to developmental events (the time fields)? Can case studies like the above Cistercian Abbey case be used to generate parameters that can in turn be used to build Augmented Context for Development in other areas? How does the work described in this paper relate to the notion of the functions of intention and symbolic representations of purposeful action? What are the implications of the above conceptually driven notion of Augmented Contexts for Development for the emerging field of mobile augmented reality (which tends to be driven by commercial developments)? And finally, how might temporality be explicitly worked into future user studies? I conclude by noting that the following three research 'threads' that have pervaded my work over the last two decades, will remain important to me in the foreseeable future as I investigate Augmented Contexts for Development along the threads pertaining to: (i) the powerful perspectives on learning and development put forward by Vygotsky, (ii) an evolutionary educational design research approach, and (iii) notions surrounding the temporal nature of learning. Indeed, more work is needed to investigate the developmental processes by which students are acting in the present, to understand the past, in order to provide at some point in the future a solution to a learning problem. Acknowledgements: Matt Smith assisted with the post-grad MetaMuse study. Carl Smith developed the GPS enabled system for CONTSENS, which is funded by the EC Lifelong Learning Programme and is headed by Ericsson Ireland. The wireframes were derived from the Cistercians in Yorkshire project ( http://cistercians.shef.ac.uk/), which Carl Smith also worked on. Professor Ben Bachmair has provided me with valuable insights that have fed into my analysis of the Cistercian Abbey interactions and my understanding of Vygotsky's work (all interpretative mistakes are my own). Finally, thank you to the two reviewers for their comments. Cook, J. (1993). Music Composition, Teaching Knowledge and Fostering Reflection. Computing Department Technical Report No. 93/13, The Open University, UK. Cook, J. (1994). Agent Reflection in an Intelligent Learning Environment Architecture for Musical Composition. In Smith, M., Smaill, A. and Wiggins, G. (Eds. ), Music Education: An Artificial Intelligence Approach, Edinburgh 1993 :3-23. London: Springer-Verlag. Cook, J. (1998a). Knowledge Mentoring as a Framework for Designing Computer-Based Agents for Supporting Musical Composition Learning. Unpublished Ph.D. thesis, Computing Department, The Open University. Cook, J. (2000). Cooperative Problem-Seeking Dialogues in Learning. In Gauthier, G., Frasson, C. and VanLehn, K. (Eds.) Intelligent Tutoring Systems: 5th International Conference, ITS 2000 Montréal, Canada, June 2000 Proceedings: 615-624. Berlin Heidelberg New York: Springer-Verlag. Cook, J. (2009a). Reflections on a 16 Year Research Journey from Mentoring, Metacognition and Music to Mobile Learning. Invited contribution at Computers and Learning Research Group (CALRG) 30th Anniversary, 18th May, Open University. Cook, J. (2009b). Mobile Learner Generated Contexts: Research on the Internalization of the World of Cultural Products. In B. Bachmair (Ed.) Media Literacy in New Cultural Spaces (Medienbildung in Neuen Kulturräumen). Wiesbaden, Germany: VS-Verlag für Sozialwissenschaft, due end of 2009. Cook, J. (2009c). Mobile Phones as Mediating Tools Within a Responsive Context for Development. Workshop: Education in the Wild. Alpine Rendez-Vous, STELLAR Network of Excellence. December 3-4, Garmisch-Partenkirchen, Bavaria, Germany. Cook, J. (2010). Mobile Phones as Mediating Tools Within Augmented Contexts for Development. International Journal of Mobile and Blended Learning, 2(3): 1-12, July-September. Cook, J. and Adami, E. (2009). Individualized Participation in Public Forms of Communication and Learning: Reshaping Contexts in a Changing World of Cultural Products. Part of London Mobile Learning Group workshop: Technology-Enhanced Learning in the context of technological, societal and cultural transformations. Alpine Rendez-Vous, STELLAR Network of Excellence. November 30 to December 1, Garmisch-Partenkirchen, Bavaria, Germany. Cook, J. and Pachler, N. (2009). Appropriation of Mobile Phones in and Across Formal and Informal Learning. E-Learning, http://www.wwwords.co.uk/elea/. Due Winter 2009. Design-Based Research Collective (2003). Design-Based Research: An Emerging Paradigm for Educational Inquiry, Educational Researcher, 32(1): 5-8. Available from: http://www.designbasedresearch.org/reppubs/DBRC2003.pdf, accessed July 2005. Pachler, N., Cook, J. and Bachmair, B. (2010). Appropriation of Mobile Phones and Learning. International Journal of Mobile and Blended Learning. 2(1): 1-21. Pachler, N., Bachmair, B. and Cook, J. (2010). Mobile Learning: Structure, Agency, Practices. New York: Springer. Plomp, T. (2009). Educational Design Research: An Introduction. In Tjeerd Plomp & Nienke Nieveen (Eds. ), An Introduction to Educational Design Research. Enschede: The Netherlands: SLO Netherlands Institute for Curriculum Development. Ravenscroft, A., Schmidt A. and Cook, J. (2010). Designing Complex TEL for Informal Learning and Knowledge Maturing in the 'Web 2.0 Workplace'. Full paper for International Conference on Educational Media (Ed-Media) 2010, Toronto, June 29-July 2010. Vygotsky, L. (1978 / 1930). Mind in society. The development of higher psychological processes. Edited by M. Cole et al., Cambridge, MA: Harvard University Press. Wood, D., Bruner, J. S. and Ross, G. (1976). The Role of Tutoring in Problem Solving. Journal of Child Psychology and Psychiatry, 17(2): 89-100. The movie that was used as the source for the HTC mobile version (which was only about 100 KB) can be downloaded from: http://learning.londonmet.ac.uk/TLTC/carl/fountains_9altars_broadband.zip (148 MB). For example see http://www.guardian.co.uk/commentisfree/2009/jun/09/education-male-female-gap , accessed 21 October, 2009.